At E3 2017 you announced by video message that we would see the latest Pokemon title for Nintendo Switch in 2018 and beyond. Can you talk a bit about where you are at currently in this regard? 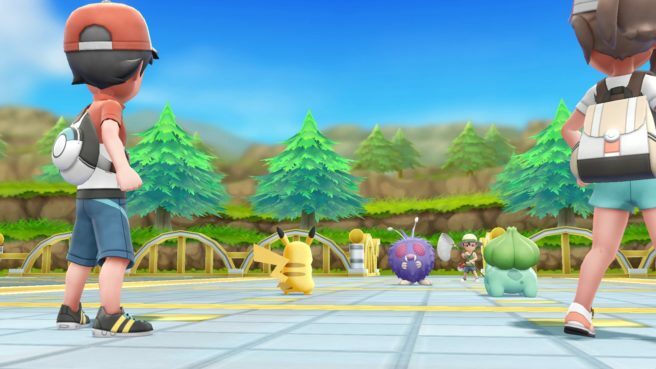 Ishihara: To avoid misunderstandings: The title we are developing for launch around the second half of 2019 is a different title to Pokemon: Let’s Go, Pikachu and Pokemon: Let’s Go, Eevee. Currently the development team at Game Freak is working on that on a different line to that of Pokemon: Let’s Go, Pikachu and Pokemon: Let’s Go!, Eevee. I mentioned previously that Pokemon: Let’s Go, Pikachu and Pokemon: Let’s Go, Eevee is a game that will help bring people who have played Pokemon GO into the Pokemon series, but the game launching in the second half of 2019 is something that I especially want those who have played previous Pokemon games to look forward to. Can you give us a hint about the contents of the game? Ishihara: Just like Pokemon: Let’s Go, Pikachu and Pokemon: Let’s Go, Eevee it will be sold on the Nintendo Switch, but the big difference is that while it is a game for the Nintendo Switch, it is made while the ‘hands on’ feeling of the previous Pokemon games in mind. We have a different play style in mind to that of Pokemon: Let’s Go, Pikachu and Pokemon: Let’s Go, Eevee. Of course, since the Nintendo Switch is a home console, we are also improving things like the graphics. But again, when it comes to play style we are focusing on keeping the hands on approach that previous Pokemon games have cultivated. So even if both games [Pokemon: Let’s Go and the 2019 entry] are both for the same console, the concept is quite different? Ishihara: I’m repeating myself a bit, but with Pokemon: Let’s Go, Pikachu and Pokemon: Let’s Go, Eevee our aim is to make extensive changes to something we’ve made in the past and have even more people experience it. If possible, I’d like those titles to keep selling not just this year, but the year after and the year after that as an entry point into the Pokemon series. On the other hand, the entry for the second half of 2019 will be a title that continues and evolves the tradition that Game Freak has built over the course of the Pokemon series. There will be many new elements and Pokemon to make Pokemon fans say, “This is what we’ve been waiting for!”. A so called ‘completely new title’. Pokemon GO is approaching its second anniversary this summer, and there are some big summer events, aren’t there? What are your thoughts of Pokemon GO as it is currently? There’s a feeling of wanting to redeem themselves for last year, so everyone is very enthusiastic. This is the team that originally developed Google Maps, so they want to take their time and release update upon update, but if you look back at Pokemon GO when it first launched in as opposed to what it is now, there really is no comparison. Depending on how you look at it, you could even say that it has changed completely. To them, that is what making something is about. In order to provide better service, more fun and more convenience, they keep releasing updates and additional content. I really appreciate that mindset. For instance, nowadays you can check Pokemon Go and see ‘Oh, it’s raining’ and so on, but back when it launched that wasn’t the case. If I look at it like that, Pokemon GO has come quite far. Raids and Community Days… The ways of playing have increased as well, haven’t they? Ishihara: At first we fumbled a bit, but I think we’ve gotten used to the development now. We’ve also expanded the scale of the development team in order to offer better quality and quantity of features. However, as much as things are changing, there are parts of our game design roots that we have to keep, such as the way a Poke Ball flies through the air or the way it moves when you catch a Pokemon. I feel that we have to preserve those things that make a game feel like a Pokemon game. I want to continue polishing and refining those aspects in the future as well. April this year marked the 20 year anniversary of the Pokemon Center stores opening. What are your thoughts on Pokemon related goods and the maturity of the Pokemon Centers themselves? Ishihara: Amongst other things, we launched the first permanent Pokemon Cafe, so things are progressing nicely. We originally started with the number one Pokemon Center in Yaesu and since then several stores have opened. The newly launched Pokemon Center DX is also in Nihonbashi, just like the number one store. As Nihonbashi is a very important place, we wanted to make a Pokemon Center that is a refinement of the first store. Furthermore, we’ve seen an increase in overseas visitors so we are considering opening up Pokemon Centers overseas as well. Since Pokemon Centers now cover most of Japan, I’m curious what your future plans are. Ishihara: One of the things that I can tell you that we are considering is vending machines. We have multiple Pokemon GO partners, such as Itoen and Softbank. Some vending machines from Itoen work as Poke Stops or Gyms but on top of that it would be fun to expand this concept with vending machines that have a certain Pokemon quality to them. Since the Pokemon IP covers a lot of different areas, could you give us a hint about the ways you are planning to expand in the future? Ishihara: It has already been announced, but as an example we are working on plans for a Hollywood movie. It feels like the scale of what we are aiming to create has gotten bigger. I think you can look forward to the impact of that in the future. We have also created a Chinese division in our company so we have high expectancies for the Chinese market going forward. That means you’re looking at further worldwide expansion, doesn’t it? Ishihara: In the case of Pokemon GO, the number of countries where it is available and the number of players have increased dramatically, but there are still areas where our service does not yet reach. As far as possible, we’d like to be able to provide content to those areas as well. Lastly, please leave a message for our readers that are looking forward to the new titles in the future. Ishihara: Pokemon Quest is a result of Game Freak’s efforts. Please download it and give it a try. Pokemon Quest is available on Nintendo Switch and soon on smartphones as well, so I think that it is an ambitious project and I’d like you to try it out on different hardware and see how the experience changes. Pokemon: Let’s Go, Pikachu and Pokemon: Let’s Go, Eevee are made to be easy to play for people that are just getting started with Pokemon. Of course, this also includes players coming to the title from Pokemon GO. The contents can be enjoyed by lots of Pokemon fans. Pokemon: Let’s Go connects to Pokemon GO and also to the Poke Ball Plus which I think is quite an advanced way of playing. Definitely try it out. Lastly, heading towards second half of 2019 we are steadily working on our new title so please look forward to further announcements. If you use any of this translation, please be sure to source Nintendo Everything. Do not copy its full contents.